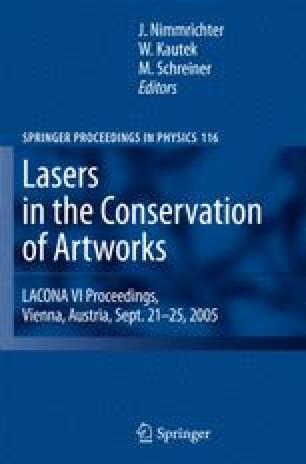 In this work a series of egg tempera paint and varnish systems have been prepared, artificially aged and irradiated with KrF excimer laser at a wavelength of 248 nm. The samples were prepared with pure pigments and selected mixtures. It was found that, for some pigments, the colour changed upon laser irradiation even at low energy densities, below the ablation threshold while for other inorganic pigmented egg temperas the degree of discoloration is very small at moderate fluence of ∼0.30 J cm?2. The varnish systems did not present signs of discoloration. The thickness, superficial roughness and magnitude of the colour changes of the samples were measured. X-ray diffraction, Raman spectroscopy and UV/visible spectroscopy were used in order to investigate the changes induced by the KrF excimer laser radiation.